Ask twenty people what a drawing is and I will bet you that at least half of them will mutter something about a pencil and paper, a few more might add charcoal, graphite, crayons or ink; one of them a pedant with access to Wikepedia might explain that it was two dimensional mark making involving transferring a small amount of the drawing medium onto a surface. I have been pondering about the nature of drawing ever since seeing the exhibition of winners of the 2012 Jerwood Drawing Prize, currently showing at the Jerwood Gallery in Hastings It comprises 78 works from 73 artists which have been whittled down by the judging committee from a total field of nearly 3,000 works. Not quite the task facing the RA Summer Exhibition selection committee but still difficult. I don’t know how the panel defined drawing and whether they took the view that if an artist considered the work a drawing then that is what it was. Works of pencil on paper appeared to be in the minority; they were certainly not all two dimensional; there was film, there was at least one photograph; there was light; there was what I might have described as a painting. There was collage. On the whole I agreed they counted but didn’t anybody on the committee say “hang on; that is not a drawing” about the festive hat or the little pile of pebbles (watch out for that one; my husband demonstrated twice how easy it is to trip over it ). But these are quibbles; it is a remarkably rewarding exhibition and unlike the RA Summer Exhibition, the pieces work well together and feel contemporary. The standard is also extraordinarily high. Pleasingly, I was in complete agreement about the overall winner. This was a short animated video by Karolina Glusiec who is only 26 and comes from Poland. It is an exceptional work which reflects on the memory of a place that was once really well known but which has changed. It explores nostalgic feelings for a place without being sentimental; it is also about the nature of memory and imagination. The commentary, which is spoken by a male voice who delivers it with just the right matter of fact tone, is poetic in itself. The words and images really work together. What is interesting is the way that the words describes a scene, which is illustrated by the pictures but which make you imagine something else. Just six minutes long it includes some striking scenes – a woman with her hair blowing in the wind created by a passing train, people going to a factory and the way that the drawing dissolves into chaos and then re-emerges. Still photographs in no way do it justice; if you have a chance, do go and see it. Of the other prize winners I also particularly liked the entry Waiting by Min Kim, who won in the student category. It comprises 834 pieces of paper on which a balloon has been drawn in thick graphite. You cannot leaf through the pages but you can sense that each carries an identical drawing by the graphite dust which is visible on the side of the pages. I really liked the contrast between the qualities of airiness that we associate with a balloon and the heaviness of the way that Min Kim has thickly applied the graphite, digging into the paper. Although the balloon is such a simple shape and, because it is black, a silhouette, you also notice the detail of the way that the balloon is knotted. Min Kim has explained that the idea came to her as a balloon filled with a deep black breath – a striking concept. Waiting: student prize winning entry by Mim Kim. There were so many other entries that I liked I am certain I will notice others when I go back. Here are a some of the works which I felt were exceptional and which give an idea of the variety. I like thinking of Carl Randall sitting on the Tokyo Underground; notebook open, sketching away. Displayed together are 72 drawings, many of them humorous: some were missing a leg, one had four hands, presumably in both cases because the subject kept moving. One was looking at a mobile phone – would it work? All of them appeared to capture the character of of the person and together gave a real impression of the atmosphere on the Tokyo tube. I counted the number of these little pencil rubbings by Ruth Simons made on red coloured graph paper; I think there were 76 vertical squares and 56 horizontal squares making 4256 all together. I kept losing my place on the counting and the idea of actually producing 4246 images is mind-blowing; imagine having got to 2123 and you are only half way there. Incidentally a phenotype, for those who like me feel they sort of know what it is but couldn’t actually define it for somebody, is the composite of an organism’s observable characteristics or traits. These little rubbings reminded me of samples growing in their separate agar jars. Strictly I don’t think this is a drawing; these are not clever marks on a piece of paper; they are clever facsimiles of tent pegs made out of balsa wood gesso and graphite powder. Ok, you can argue it like this; they have graphite on them; graphite is used for drawing, therefore this is a drawing. This is actually an excellent example of a false syllogism. They are not drawings they are model tent pegs. Having got that little rant over, I was pleased they were included as I really liked them, though I found it hard to explain to myself why. It was something about the shininess and being other than what they appeared. I looked up Kapar Pincis’ website and he can actually draw; he also makes a lot of tent pegs. He was one of the few artists who had two works included in the exhibition; I also liked the other one created with a typewriter on newsprint: As if you could kill time without injuring eternity. Proving that drawing as a skill is not dead, is this work by Tanya Wood. It is not a conceptual piece but it is a remarkable drawing of a pillow which is perhaps one of the most featureless objects you can imagine but it is perfectly captured. ; you can almost feel its pillowyness. It is not just any pillow; it is that particular pillow – a portrait of a pillow which starts you thinking about the heads that have lain on it and made it that way. Crossing the Line is a remarkably funny video which illustrates the verbal mannerisms of as American pastor discussing marriage, commitment and prayer. As you can see he speaks about crossing the line a lot and every time he does, the hand demonstrates by crossing the drawn line on the piece of paper. I laughed out loud. Richard Galloway’s Dolor is a hand painted lino cut and quite exceptionally detailed; it is an imagined London landscape where all human life is present. The politics may not be particularly subtle; a loan shark offers loans while behind the wall a man hangs himself. Even so it is hugely lively and repays studying as you notice more and more details. You could hardly miss this large bold self portrait by Ishai Rimmer drawn, and in this case I do agree it is drawn, in household paint on paper. There is something about the size, the apparent simplicity of the image; the washing machine the oven. It is unmistakably now. Footnote . I have just read Lisa Milroy’s account of the judging process and the entries they considered. Apparently there was a recurrent theme and that was hair -“By the end of the judging process, we had looked at dozens of drawings of heads of hair, chest hair, tufts of hair, beards, single strands of hair, wigs, and real hair sandwiched between glass or glued to paper in suggestive swirls or spelling out words.” she wrote . Perhaps unsurprisingly after seeing so many a drawings, not a single hair got through – unless it did and I missed it. 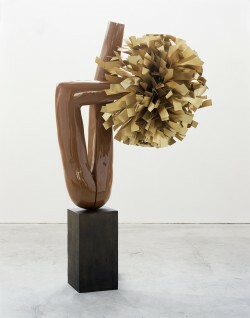 Though Judith Alder’s work reminded me of hair, it was not clear it was intended. It seems a pity – no hair; on the other hand I was really glad they didn’t include any of the dogs or squirrels. The Jerwood Drawing Prize will be showing at the Jerwood Gallery Hastings until January 6 2013. In a former lifetime when I was a civil servant, for a short time I had a management coach. Everybody was supposed to have so many days of training a year and they were the vogue at the time. So this bloke would turn up once a fortnight I would moan about whatever it was that was bugging me at the time and he would always say ‘what could you possibly do?’ In the end it became internalised and was actually rather useful because listing everything you might possibly do to solve a problem occasionally brings up something you haven’t thought of, or, more often, makes you realize that every option is bad and it’s a matter of choosing the least dreadful and that at least stops you beating yourself up about it. I have thought about him several times since starting the art course at Hastings College because the Head of Course, Patrick Jones, has a way of saying – ‘what are you trying to say?’ or simply ‘why?’ and it is becoming internalized in the same way. It not just in me but with other students as well. Saying ‘well I thought it was a good idea’ or ‘why not?’ never seems a very satisfactory answer. 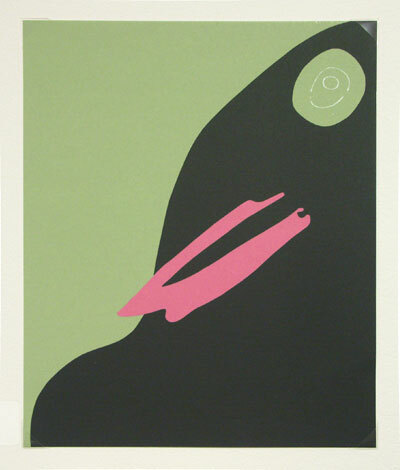 Having visited the latest Jerwood Exhibition which is showing Gary Hume, I have been thinking that perhaps – ‘I just thought it was quite cool’ might be legitimate after all. Why do we demand that artists not only create art but also tell us their innermost thoughts? Why should artworks communicate something rather than just be? Six or seven hundred years ago it is unlikely you would have asked a medieval painter ‘why?’ – the answer would have been self-evident: the glory of God, or because his patron had commissioned a portrait. But at that time there would have been a consensus about what constituted art and to a certain extent the standard to which artists should aim. Now with no real consensus about what constitutes good we demand something different – originality for sure, but also that art is created in good faith. There is something of a collective fear among non art aficionados and collectors alike that when art can comprise a dead shark or the cast of a urine stream, that were it not created in good faith, we would be taken for fools. Artist statements and the blurb that artists write about their work is all evidence that the art is, so as to speak, the genuine article. Refreshingly, this is a game which Gary Hume refuses to play. “My paintings do not mean that or this. They don’t mean anything.” He does not pander to our insecurities. His pictures are what they are. Hume was one of the Young British Artists and exhibited at the Freeze exhibition. His early success was of doors painted in gloss paint. His doors are doors – not gateways, not symbols but doors. But the gloss is important – gloss paint reflects light. It is also utilitarian; it is not painterly. All his work glimmers; the Jerwood, with its wonderful natural light, shows them to advantage. 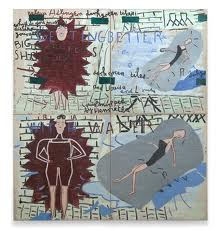 In the exhibition at the Jerwood there was a painting I particularly liked – Four Feet in the Garden. Though there seemed to be eight, it is still a painting of feet. 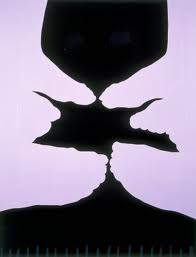 But if there is no message, it remains an extraordinarily clever work. His sculptures show a similar simplicity. 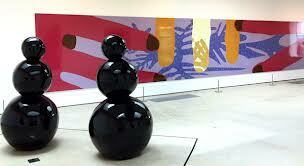 In the exhibition there is one of his snowmen ; they are quite extraordinarily tactile. The video showed larger examples; people were drawn to to them and and ran their hands over them. You long to do the same. They are featureless; each of them portrays not the front of a snowman but as it would appear from the back but there is a completeness which is deeply satisfying. It would be nice to stroke the one in the Jerwood but Myles Calvert is there; he tells me he how he had to struggle to prevent one woman touching it; I decide not to cause trouble but we both try blowing on American Tan; it faintly quivers. Along one wall is a splendid painting comprising four panels; there is no explanation of what it is about. There are hands undoubtedly and possibly, or possibly not, snowflakes. In view of the snowmen, I’m pretty sure they are snowflakes but you know it doesn’t matter.